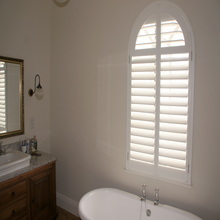 One of the best settings for the use of shutters is over french doors. In this Bristol bedroom, we specified 89mm slats in hardwood elm to show a little of the timber grain and matched the colour to the room decor. 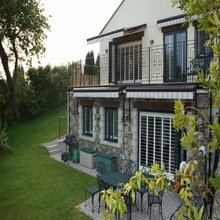 The side windows were installed seamlessly to the doors and create a completely fitted look. 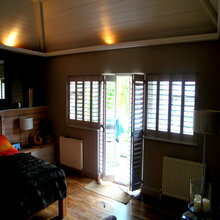 An increasing number of discerning homeowners are catching on to the benefits of shutters.. its a fact. We certainly find ourselves doing more and more projects in the beautiful County of Cornwall and this very recent project near Saltash was one of our largest projects to date. 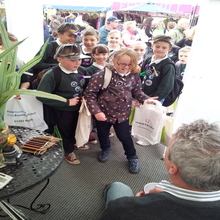 West Country Shutters at Devon County Show. 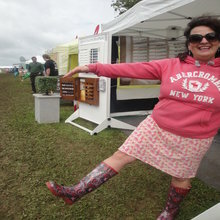 After three busy days at The Devon County Show, we had a great time promoting our shutters … as an added bonus it hardly even rained! We met loads of shutter fans over the course of the show, as well as welcoming to our stand… ‘Jonty’ Depp, Puss In Boots, a classroom full of schoolchildren, past clients, friends and family… great fun and thanks to everyone who dropped by.